LAUNCH F18 is proud to present a group exhibition put together by Jack Pierson, featuring new work by undiscovered artists and legendary icons working in a variety of media, including painting, sculpture, ceramics, and video. The artists chosen for this exhibition are unrepresented in New York by any commercial galleries. For many of the artists, this will be the first time their work is seen and for some, the first time in awhile. Since the beginning of his career, Jack Pierson has curated over ten group shows that all emphasized a cross generational exuberance. This month's exhibition at LAUNCH F18 will be an exciting addition to a history of collaboration among artists, the first being the 1992 exhibit, Some People, at Tom Cugliani Gallery. 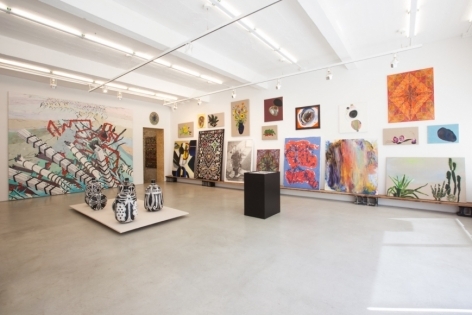 Roberta Smith of the New York Times noted that the salon-style installation of that first show "...intensifies the exhibition's pleasures and the dialogues between the various images, personalities and artistic styles.” Pierson's most recent curatorial effort was in Paris at Galerie Thaddaeus Ropac, inspired by his self-published series, Tomorrow's Man. Photographer and artist Jack Pierson assembled this massive roster of 19 artists from a variety of mediums and generations, all of whom are unrepresented by commercial galleries in New York.